The Netaji Subhash Place metro station is an interchange station between the Red Line and Pink Line of the Delhi Metro, catering to the Pitam Pura area of Delhi. This newly opened (March 2018) interchange acts as an alternative route for those going to Blue Line, alleviating crowds on the heavily used Yellow Line. There is a pedestrian walkway that connects it to Ring Road. Max Hospital and D Mall are located across the road. There are four ATMs in the station premises (Standard Chartered Bank, Punjab National Bank, State Bank of India and HDFC Bank). The station is situated in proximity of Pitampura TV Tower and Sri Guru Gobind Singh College of Commerce , affiliated to Delhi University. Dilli Haat is situated just outside the metro station, which hosts various cultural fests and programmes. Delhi Transport Corporation bus routes number 114, 114+990, 114A, 114B, 114EXT, 114ST+901, 174STL, 182A, 182ACL, 247, 761, 889, 9O1, 901CL, 921, 921EXT, 971, 985, 988, 990, 990A, 990B, 990CL, 990EXT, 997, GMS (+) (-) serves the station from nearby Subhash Palace bus stop. Delhi metro feeder buses are available outside gate no. 1 towards Haiderpur and Shalimar Bagh. ^ "Station Information". Archived from the original on 19 June 2010. Retrieved 26 June 2010. "Station Information". Delhi Metro Rail Corporation Ltd. (DMRC). Archived from the original on 19 June 2010. Google. "Netaji Subhash Place metro station" (Map). Google Maps. Google. 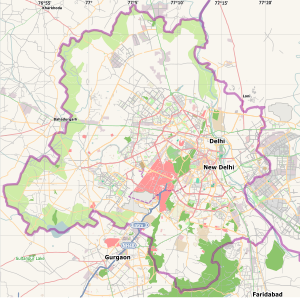 This article related to the Delhi Metro is a stub. You can help Wikipedia by expanding it. This article about a railway station in the Indian union territory of Delhi is a stub. You can help Wikipedia by expanding it. This page was last edited on 15 January 2019, at 03:35 (UTC).